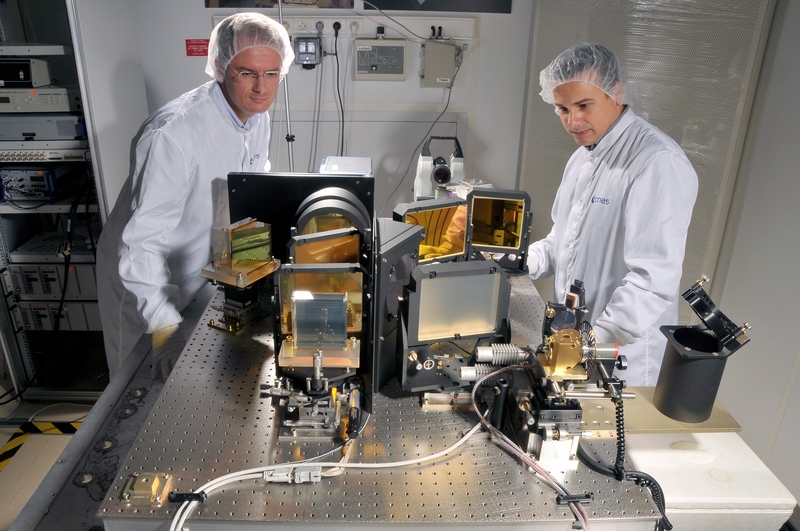 CNES, the French Space Agency, has awarded Airbus Defence and Space, a contract to design and build the optical instrument for MIcroCarb. The industrial contract kick-off took place on April 5th. Its delivery is expected in 2019. After launch in 2020, the satellite will study carbon dioxide sources (which produce CO2) and sinks (which absorb it) to understand how this greenhouse gas is affecting climate change. The instrument, weighing 60 kg, is optimized to determine the concentration in CO2 with an accuracy of one part in a million. This mission complements Merlin, which measures methane levels by LIDAR, an instrument that measures distance by illuminating a target with a laser light. MicroCarb will be placed in a polar orbit at 700 km ensuring a global coverage. The instrument will measure the solar radiation reflected by the Earth at visible and near infra-red wavelengths. The CO2 molecules absorb part of the radiation, especially when they are abundant. The concentration in CO2 can then be measured by analyzing the spectrum obtained by the instrument over an atmospheric column. The collected data will then be processed and shared this the whole scientific community.